Budget refers to the blueprint of how you will spend the money in the coming months. It gives you an idea of where to spend and how much to spend at a time. In the budget, you ought to pen down the total income and the expenses each month and plan further how to adjust and where to adjust the income and expenses for further planning. Financial planning of budget will help you know the approximate figure of the expenditure that may arrive with the baby in family, thus making you feel relaxed for the rest of the coming year. You need to buy what you can afford. Keep your hand on the things that your pocket can spend at and do not be a spendthrift, building debts for yourself. Your habit of spending unnecessarily will cheat the budget and will create tensions for you. So, it is advisable to spend less and manage salary in a better way. The needs refer to something with purchasing power like the things you keep in the priority must be bought at first. The wants refer to something without purchasing power as the wants come secondary. For example, the basic necessities will include in needs while the wish for having a big car will include in the want. So, check it out what your needs are and what your wants are. Therefore, first go for the needs and then for the wants. Even if you will save money every month, you will get money hefty, at the end of the year. So when you plan a budget, make sure you keep some of the amount out in the savings column to keep yourself ready for any sort of the emergency. A pot gets filled with every drop of water and in the same way, saving from the very start will help you in paying for the college or the school fee in the near future. Make a list of the things which are being added with the arrival of the baby. Plan the expenditure accordingly as you may have to deduct many of your expenses and also you may have to leave many of your regular desires of having an ice cream and such. Think of the necessities of the kids and follow them in the budget planner. You may be spending on the silliest of the things like nail arts, nail extensions, coffees, taxis, or many of the other bills on a regular basis. You need to cut down on them so as to make some space for the kid’s wants, desires and needs. You just need to make lists of everyday expenses, although it is not easy, but it is the only way your expenses will cut down to deeper levels and good amount of savings will be done. Prioritizing things will make your goals clear and also you will be able to achieve them. Now you will get a grip on what is coming in and what is going out through the plan you made, what things you need for your health, for the baby’s health, the medicines and many other essential things must be given a priority. Making a goal is not about just making, it is also about achieving it at the right time. If now you will not set the goals, you may not achieve them in near future. Emergency plan means the money that you will save today will help you tomorrow in the case of the emergency. Emergencies can be of any kind like any major injury, someone getting hospitalized due to bad health and any other miss happening can occur which can lead to spending a heavy amount on the spot. Many times it is difficult to arrange for the money on the spot, so it is advisable to create best ways to save money for emergency purpose. Investment can be of any kind. Either you can buy a property at less rate, or you can go for the shares and debentures in the market that provides you good returns in the end. Although investing in shares is a sort of risk as the shares may fall at any moment you may not know and in case the shares rose, you can be at profits, but whatever it is you can invest in it, or property, or even in gold. So, go ahead with this and get the best for yourself and the kid. If you have any of the loans and the credits taken from anyone, first pay them out. Make yourself debt free and then reach to the next step. If you have spending money to be given, then how will you expect to have a good future with the baby in terms of money and financial status of the house. So, in order to start with the stress free budget, pay off all the loans as soon as possible or the interest on you will rise and it will lead to failure of the planned budget. The insurance policies are a great plan for investing for the brighter future. These policies are good for better and secure future. What you invest today as a small amount, you get it tomorrow at the time of need a lump sum amount, helpful for you and your family. If you know you cannot afford to have branded stuff all the time, then why not move to the products, the clothes that are available for sale. The things on sale are also good, unless you have the keen eye on the best thing. Also cut the expenses on the branded clothes for the kids as they go waste for the only reason the kids grow early and the money spend on the branded stuff goes waste. Earlier you may have one or two servants at home, but you need to manage without servants for some time as you have kids with you. With servants the expenditure is certainly going to rise, so expel one servant and set the budget plan accordingly. The pay, you give to the servants can be saved for future, hence reducing the expenditures. It seems little selfish but is the right way as you may have heard of getting loans for the study but not for the retirement. So, start saving for your own retirement also. What you will save today will come as a boon to you tomorrow at the time when you will have no other source of income than the money invested and saved. Whatever amount you decide to save for the retirement, make sure you do it from today and do not delay in this decision. You can let your kids study in government schools and not in the convent schools as the private and the convent schools charge a lot in the name of the academic fee. Be the guide to your kids and do not spend unnecessarily on the tuitions as it is just the extra money or amount you are burning without any reason. If you can guide and teach the kids at home, then do it on your own and save the amount which can be saved. You can save the money by reducing the number of trips and the parties you enjoy. Trips and the parties are the father of all the wasteful expenditure as for the party, you will wish for the new dress, new accessories and all. In the same way for the trips too, you wish for the new things and the desire for the novelty things everytime is adding flexibility to the existing expenditures. What you spend is all in your own hands, no one forces you to spend, it’s just the adjustment of your mind and the money that can help you in spending. Having trips once in a year is fine, but planning the trips and parties every two months will certainly not do any good to you. Yes, it may sound different, but paying yourself means paying from your own salary. It means you have to set the amount in the budget and if you do not have enough to pay right now, set the amount aside for your personal expense. If you will not pay and someone else will pay your amount then you may have to add the amount in the credit column, which is not right as it will only add debt to you, ultimately will generate tension. The piggy bank is a great tool to trap the expenses and increase the savings. Get a piggy bank at your home, keep it on the table, it will serve as a toy for your kid and can also be an interesting item to look at. Serve the piggy bank with the least amount you have in your hands. For example, you may have a five rupee note in your hands, put it in the piggy bank and just do it every time you have the coins and the small number notes with you. Ask the kids to do the same and one day you will notice the amount you collected. Although the idea is quite childish but it really will work for you. If you do not find money saving tips interesting enough, then you can reach out to the professionals for some guidance. They can easily tell you the ways of managing the expense and the revenues, the planning of the budget and also many more things that you may not know. You can talk to the accountant, or the financial advisors for the same as they will help you make the budget more flexible and transparent. Once you have been given the salary statement, don’t just look at it, but concentrate on the amount. Proofread the entire slip so that you can go through any goof up if any done by the accounts department. Make sure the deductions and the additions are as per the policies and if the budget is prepared by the accounts expert, then keep a track of what is being added and subtracted . So above are some of the ways by which you can manage your money. 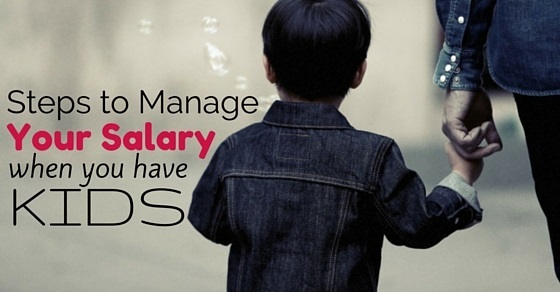 Managing salary with kids is not a big deal. Just you should have the knack of creating a viable budget that can be easily followed by you and your partner. Spending lavishly and not thinking of the consequences can lead you into the trouble in the future. Planning the way you will spend your salary is among the good virtues and also make the kids learn the value of savings. Not just this, you also get a chance to know the trick of budgeting and yet bringing the best for yourself and your family.